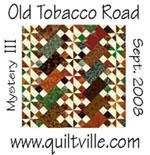 This past weekend was QSC (Quilters Of SC) Pieceable Retreat. 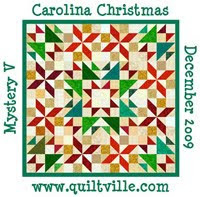 This is an annual retreat for quilters from all over South Carolina. We had a record amount show up, over 300. Lots of new classes and lots of fun was had by all. I took a One Block Wonder Class that was fun. It is interesting to see everyone's fabrics, they were all different. One of the things the teacher, Beth Karr, did was take us on a field trip to the venders, in groups of five. She had each of us pick out a fabric or 2 that we thought would make a OBW. Then she discussed the whys and why nots of each fabric. What a great idea. And YES, I went back and got the magnolia fabric!! Here is a picture of mine from the class, the orange and blue fabrics. See the strip to the right side, that is what I started with. It is amazing what comes out of these. The bottom is one of the other girls in the class, sorry cant remember which one, but great fabric. This was from 2 fabrics with the exact same print and colors, except for the background. One was cream and the other blue. 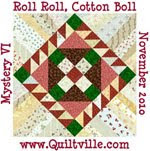 This quilter made a set from both and combined them. What a great idea and doesnt it look great?? Here is Jodie's. She used a fabric with planets and stars. Looks like Star Trek. Great fabric. Some of my pictures came out dark, so I cant show you all of them. Next are 2 that Beth, the teacher, has made. The others came out just too dark. Guess it is about time for a new camera. The light was good in the room and I think the flash was working ok, but you never know. Last, but not least, we had special guests in out class room. Meet Roada and Rhoda. They are quilt traveling rodents. They are supposed to be porcupines, but I think they are too soft for that prickly job. Roada lives with Joyce and Rhoda lives with Beth. You can follow their escapades here roadaftripp.blogspot.com/ . Hope you enjoy the travel of the R sisters.